The UK’s solar output topped that of any other generation technology over the weekend as the UK’s heatwave continues the record-breaking trend of solar generation. Data from the government and National Grid-backed Sheffield Solar PV_Live project showed that on Saturday 30 June at around lunchtime solar delivered ~9.38GW which, while just shy of a new generation record, was equivalent to almost 28% of supply. As the afternoon continued, solar is then thought to have topped gas output, which has only occurred a handful of times since the first reported instance in April 2017. 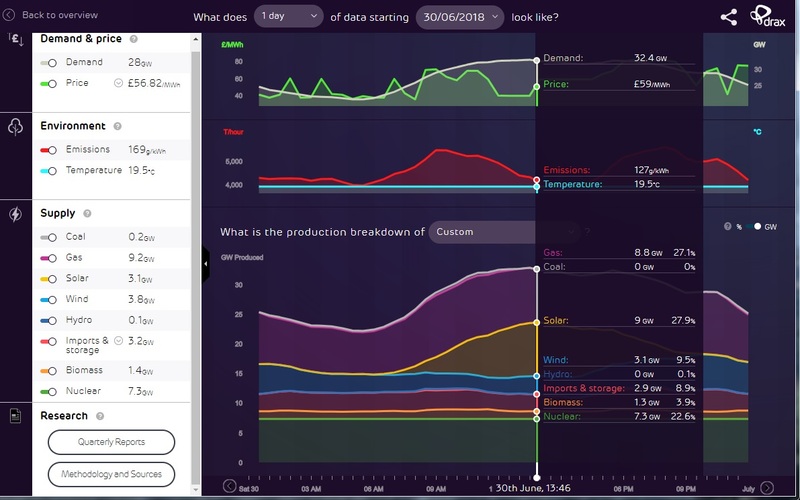 This was supported by Drax’s Electric Insights platform produced by Imperial College, which showed that for over an hour from 1:46pm, solar generation stayed ahead of gas which only regained the top stop at 3:15pm. Across all low carbon energy sources, well over half (56%) of electricity in Great Britain was being provided at around this time according to National Grid’s Control Room. The performance of the country’s solar generation assets on Saturday capped a record-breaking week for the technology. According to Sheffield Solar, 533GWh of electricity was generated from solar, setting a new record for a full week. 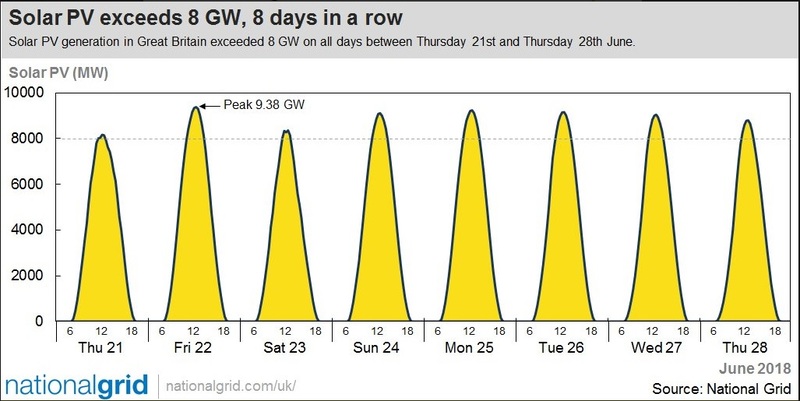 On Thursday 28 June, National Grid revealed that PV generation in Great Britain has exceeded 8GW for each of the previous eight days. This included a peak of 9.39GW on Friday 22 June, slightly above the level seen at this weekend. Additional data compiled by Sheffield Solar’s PV_Live tool shows that these instances are continuing a trend that has been underway since the first quarter of 2018 when renewables’ share of electricity generation in the UK topped 30% in the first three months of the year. 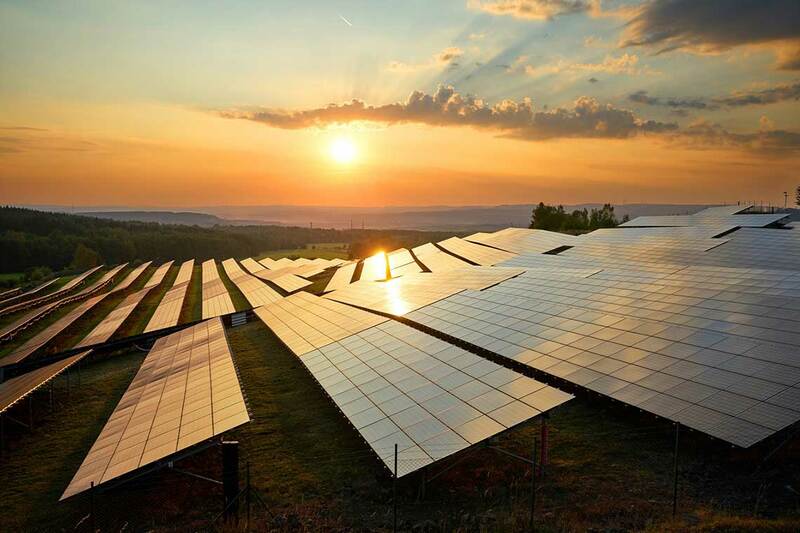 However, with solar far more suited to the brighter weather in recent weeks, solar will have enjoyed a far more favourable Q2 with preliminary figures showing a record-breaking May. Solar was found to have regularly contributed more than 20% of the country’s power supply within hourly periods of the recent heatwave. PV_Live data showed that solar produced around 1.77 TWh of electricity in May – more than the total figure for Q1 2018 alone – and far beating the previous record of 1.47TWh generated last May.